In upcoming miniseries Terminator 1984, Sarah Connor's just destroyed the time-traveling cyborg that's ruined her week, but the story doesn't end there. No, she must now contend with a shocking revelation from Kyle Reese's comrade-in-arms, Ben. Here's our spoiler-free review. Terminator 1984 takes place before the Terminator franchise became über-blockbuster, during a kinder, gentler time when there was no Eddie Furlong, Bill Paxton was a punk, and theme song was played on a synthesizer. It's during this unexplored chapter in Sarah Connor's life that author Zack Whedon and illustrator Andy MacDonald reveal new secrets of the Terminator mythos, most notably the time-jumping quest of Kyle's friend Ben. It's best to think of this miniseries as a "lost tale" — none of these events are addressed in the main Terminator properties, nor is there a likelihood that this series will deviate radically from the franchise's set trajectory. Mind you, Judgment Day is an inevitability, and the franchise has eschewed it only with extensive time-traveling (hello, Sarah Connor Chronicles). Still, that doesn't mean there isn't material for Whedon and MacDonald to mine. The comic offers an interesting portrayal of the corporate predecessors to Skynet, who would naturally be a tad discomfited by the fact that a raggedy stranger like Kyle Reese would know so much about their plans that only exist as blueprints. Another neat facet of this comic comes from Ben, who actually has the opportunity to absorb the novelty of living in the past, as his quest is more open-ended (and less shoot, run, shoot) than Kyle's. 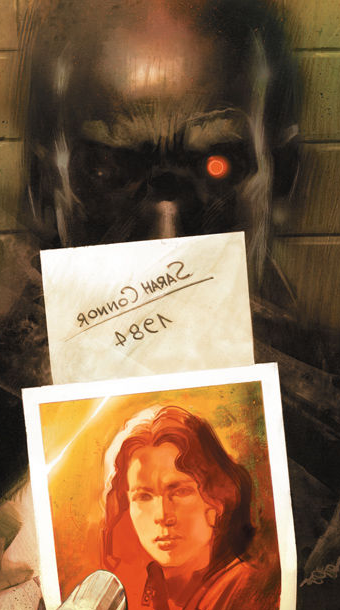 The comic closes on a huge twist that could shake up the Terminator mythos. Given that this twist would upend everything we know about the franchise thus far, I'm betting it's a red herring. All in all, Terminator 1984 is a quirky extended universe tale. The Terminator franchise is built around the inevitability of a robot uprising, so effectively gleaning new stories from this framework is no small feat. Recommended for those who like their killbots pre-CGI. Terminator 1984 #1 is available Wednesday, September 29 from Dark Horse Comics. You can read a preview here.